There is more variation in New Zealand bed sizes than in Australian sizes with lengths and widths rounded to both round 10cms and to imperial measurements. As metrication becomes more ingrained into society it is likely that sizes rounded to 5 and 10 centimetres will become the norm. Extra long single beds are also available in New Zealand with sizes available 90cm x 200cm (0.90m x 2.00m or 2'11" x 6'7") and 90cm x 203cm (0.90m x 2.03m or 2'11" x 6'8"). Similarly to Australia there is King Single variant at 105cm x 200cm (1.05m x 2.00m or 3'5" x 6'7") and 105cm x 203cm (1.05m x 2.03m or 3'5" x 6'8"). NZ longer doubles are generally only available as Queen and King size. A 150cm x 200cm (1.50m x 2.00m or 4'11" x 6'7") variation of the queen size is sometimes found. As metrication becomes more ingrained into society it is likely that this will become the norm rather than the 152cm x 203cm. The New Zealand King size is slightly narrower than those from America or Australia. 168cm (2.68m or 5'6') width King size beds are also sometimes found. 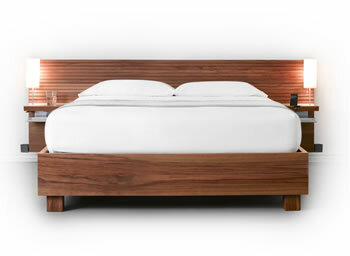 As with the Queen Size some modern King size beds are 200cm (2.00m or 6'7") long. The NZ Super King is also known as the 6ft King and as with the other types of bed a 200cm (6'7") version is also available.